IK Multimedia is offering a free update to the AmpliTube Slash suite of amps and presets for the Mac/PC version of AmpliTube. This update was created in collaboration with Slash to coincide with the recent launch of his latest album, Living the Dream, which features Myles Kennedy and the Conspirators. The two AmpliTube Slash amp models—the Marshall JCM Slash Edition Silver Jubilee and the Marshall AFD100—have been fine-tuned using IK's latest DSP technology under Slash's direct supervision. In addition, a collection of 13 new presets designed by Slash to match the tone of his new album have been added, so that fans can replicate the sounds of each song in a realistic way when they play them. Slash reflected on his experience with AmpliTube that led to his involvement in a signature edition, saying "I have to say, it's probably the best amp modeling that I've ever worked with. I've worked with a few different ones, and this is by far superior." Each AmpliTube edition is designed to offer all levels of musicians the tools they need for music creation, practice and live performance. 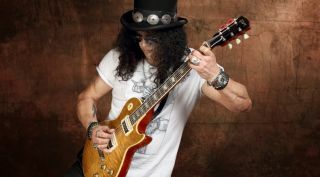 Slash has used AmpliTube for a variety of projects. "I've used AmpliTube to record a whole bunch of different things as final recordings," the guitarist said. "I did the 'Angry Birds Space Theme' for that version of Angry Birds using AmpliTube through my computer. I just did a new video game with AmpliTube as well. Recently, I recorded some stuff for Universal Studios' Halloween Horror Nights. So a bunch of the music in the theme I did for them I recorded with AmpliTube." For more information on the amp updates, head on over to ikmultimedia.com.